Here Robert E. Lee, riding from Appomattox to Richmond to join his family, pitched his tent for the last time on April 14, 1865. He stopped here to visit his brother, Charles Carter Lee, who lived nearby at Windsor. 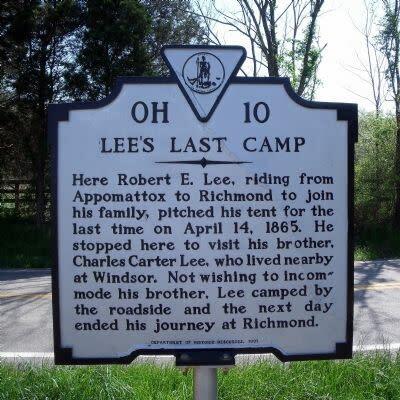 Not wishing to incommode his brother, Lee camped by the roadside and the next day ended his journey at Richmond.